This is everything you need to adapt your Lee Precision Melter into a fast, accurate annealing system. 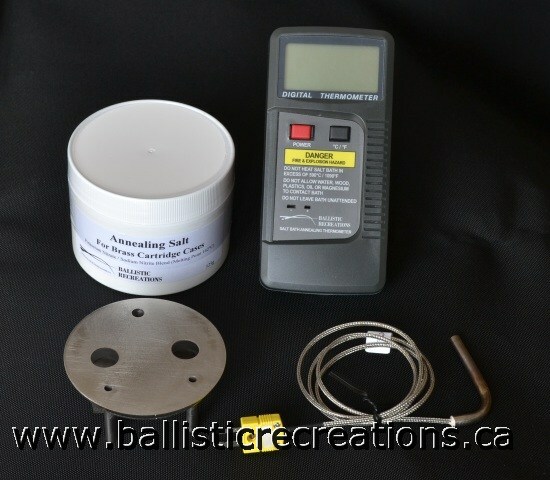 A case holder; 325g of heat treating salt specially selected for use with brass; a thermocouple that hangs in the salt bath from the case holder, hassle-free; and a digital thermometer for easy, accurate monitoring of temperature. 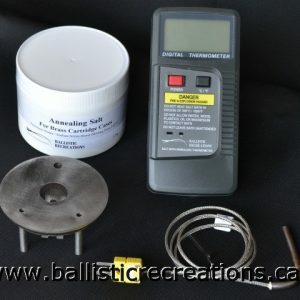 You can be annealing your cases the fast, precise, accurate way within minutes. Although the salt can be reused indefinitely, you will lose some to drag out. The salt jar supplied with the kit is sufficient to fill the Lee Precision Melter pot for first use and keep it topped up through the annealing of several hundred cases. If you expect to anneal frequently, getting an extra jar of salt is a popular option. 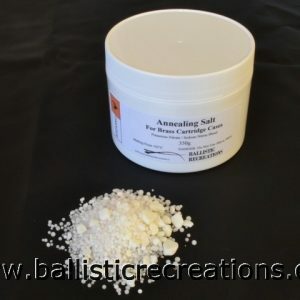 Having used salt bath annealing when I was in College studying Metallurgy, I was familiar with the process and was glad to find this product engineered specifically for rifle brass. The product was produced and delivered just as described and performs quite well. Although it may not be as fancy as an induction annealer, I am quite certain that from a metallurgical perspective it is perfectly adequate for the task at hand. My first group of cases to anneal show distinctly improved bullet seating consistency between once fired and 4X fired. For the first time I found the smoking to a bit more than expected, but I think this was attributable to the Lee melting pot burning off for the first time, the smoking ceased after about 30 minutes and was not present at anneal temperature of 500-525C. Although the standard size plate has two holes, I only used one and found a good rhythm of a 5-6 second dwell time. Insert with one hand, count 5 beats on the metronome (Free phone app), and then extract and lightly tap the case on the center of the plate to help reduce the drag out, and then drop in the bucket of water to quench. While doing this keep an eye on the thermocouple, and adjust as necessary to maintain temperature. I found roughly 7-1/2 setting to maintain the temperature between 500 and 525 at this pace, for 223 Rem, 308 WIn and 6.5 Creedmore. Two cases at a time may perform differently but I found it to remain consistent regardless of case mass at this rhythm.